I wuz setting up a Squidoo Account Even though I don't hav anee lensez yet and I foundz this photo uv me and mai sistur Luna wen I wuz really little befoar we started fighting all teh tiem. I finks I will be nice to hur today. Loki updates the progress of Laz the Zombie Kitten, also shoutouts, moar Hai Koo. I NOES We Iz Live Nao! I puts this pikture up at I Can Has Cheezburger and teh pikture turnded out OK but teh advanced editor haz called teh title "Cleverness here" insted uv "I Noes We Iz Live Nao!" Iz not very advanced if U aks me. Iz OK, mebbee it wuz mai paws slipped. Anywayz, it iz mai Kent Brockman impreshun when Bart stolded his danish. Hai Koo and Caffeenaded Cheezburgerz! Loki vlogs about "caffeenated cheezburgerz" and shares his mad hai koo skilz. Features "Oranj cat" "I can has sushi?" and "I has bugz". Also a few shoutouts, by no means complete. 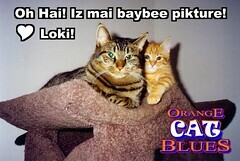 Loki explains the circumstances surrounding the arrival of his rival, Laz the Zombie Kitten. Also how to get Loki text messages through Twitter. Loki's editable interview for the book Best Friends No Matter What.